If you have a Kansas Green Infrastructures case study you would like to see on our website, please email us at sbeap@ksu.edu> with the details. The project implemented green infrastructure/nonpoint source pollution control practices within the Justice Center campus, including rain gardens, bioswales, vegetated swales, dry and wet extended detention basins, bioretention, basins, and native vegetation areas. A formerly flat and weed-covered lot was transformed into an area landscaped with low maintenance native plants, grasses, and trees. In 2008, Rossville's Healthy Ecosystems-Healthy Communities (HEHC) project team and community volunteers decided to build a rain garden to treat the runoff from a new parking lot in their city park. This project addressed water quality improvement by promoting buffer strips in farm fields and rain gardens for residential settings. One of a few LEED certified buildings in Olathe, this project shows examples of rainwater capture. This project was implemented to capture storm water runoff from the growing west campus buildings. This project includes permeable pavement pavement and a rain garden. 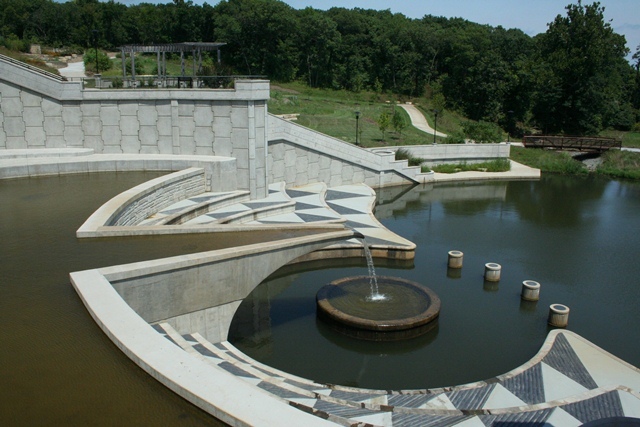 Developed by the Concrete Promotional Group, this PDF document provides photos and short descriptions of pervious concrete installations throughout the Kansas City area. This project was installed in late 2009/early 2010 and is part of a LEED building. Visit this website to learn about the efforts Kansas is making restore our streams.